You're probably wondering why I'm posting a gift guide in the summer when we're months away from the holidays. (I am not ready for that. Don't worry.) The reason is simple - we are right in the middle of gardening season, and this is the ultimate time of year to give gifts (birthday, housewarming, hostess, or just friendship) to those who love gardening or just appreciate the beauty of gardens. I've sort of had garden themed gifts on the brain because both my mom and one of my best friends have birthdays coming up in the next couple of weeks and both are big fans of plants, gardens, and all things green. In my search for unique garden and greenhouse inspired gifts, I came upon the beautiful goods you see above - so obviously I had to share them with you as well. 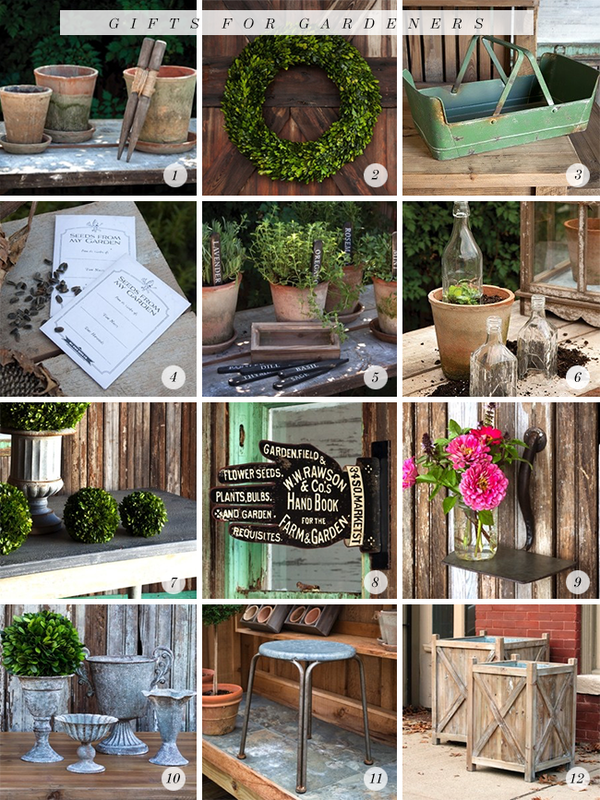 Each of the items I posted above come from Antique Farmhouse, an incredibly cool, all-women run business that, in addition to these gorgeous garden inspired goods, features a huge selection of unique farmhouse style decor, industrial decor, vintage reproductions and other chic home decor via special design sales that are up to 80% off retail. They offer multiple sales events that include furniture, design lines, decor and art products at major savings - but they sell out quickly, so when you see something you like, you have to grab it quickly. You can view the sales directly on their website at anytime, but if you don't want to miss out on the best items, you can sign up for their daily email list. This post is in collaboration with Antique Farmhouse. Thank you for supporting the brands that help make Bubby and Bean possible. Love the cloches and the sign! I love all the boxwood stuff. These are great ideas! I love gardening accessories like #3 and #5. I just wish I had a green thumb like my Mom!